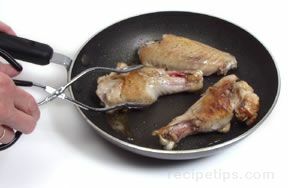 Pan-frying is similar to sautéing except that a little more oil is used, the turkey pieces are larger and thicker, and the cooking process usually requires more time. High heat is used to sear the turkey pieces in order to brown the surface and seal in the natural juices. This is followed by a longer cooking period over somewhat lower heat (medium to medium-high depending on the thickness of the meat) in order to cook the turkey to the proper doneness. rather than sautéed in order to cook the meat to the proper doneness. The skillet should have a heavy bottom so that heat will be conducted more easily. A large, well-seasoned, cast-iron skillet works well or a heavy nonstick pan may be used. Make sure the pan is of adequate size so that there is plenty of room to brown the turkey. If the pan is crowded, the turkey will steam more than it will brown. Because of the size of a turkey, individual sections such as the breast or leg are usually cut down into smaller pieces to make them easier to handle and to allow the pieces to cook faster, but they should still be larger than the thin cutlets used when sautéing. Smaller pieces such as the wing parts may be fried whole. The turkey pieces should be patted dry with paper towels to remove excess moisture. Seasoning can then be added. The turkey pieces are placed into a hot skillet containing heated oil. The oil should sizzle when the meat hits the pan. If the oil does not sizzle, it is an indication that the pan and oil are not hot enough. Do not use a fork to turn the pieces because piercing the turkey allows juices to escape. A tongs is the best utensil to use for turning the turkey pieces in the pan. Unlike sautéing, the turkey pieces can be turned more than once because the pieces are larger and require a longer cooking time. 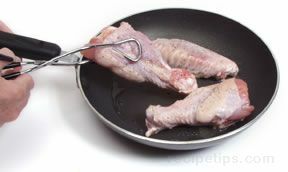 Leaving the meat in one position in the pan for too long may cause the exterior of the meat to become burned and overdone before the interior is cooked to the proper doneness. Turkey pieces should be cooked until the internal temperature reaches a minimum of 170°F to ensure that harmful bacteria have been destroyed. 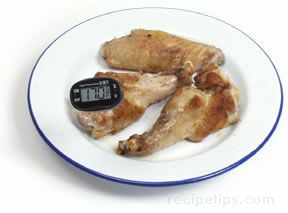 A meat thermometer should be used to check the internal temperature. A thick turkey steak may be removed from the pan, covered, and allowed to rest for a few minutes. The temperature will continue to rise an additional 5°F and the remaining juices will settle, resulting in tender, flavorful turkey.